For those who are looking to incorporate more vegetables into their diets, or simply wanting to liven up that salad with a new look, spiral slicers are all the rage right now. 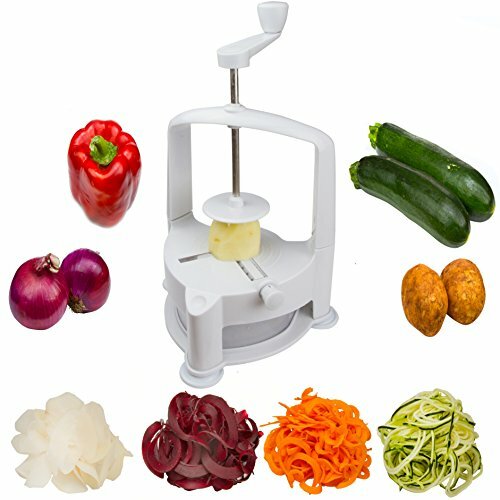 With a simple crank of the lever you have noodles of zucchini or ribbons of cabbage for your next meal without all of the effort from chopping and slicing with a traditional knife. Many are even making healthy “pasta” out of vegetables such as sweet potatoes or zucchini using these little gizmos, and with all of those health benefits, one can see why. They are simple to use and may even have your kids eating more veggies without the fuss! Read on for ten spiral slicers to consider for your kitchen. The company compares this little gadget to an old-fashioned pencil sharpener. You simply stick your carrot or other vegetable into the end of the spiralizer and twist, then watch as the magic happens. 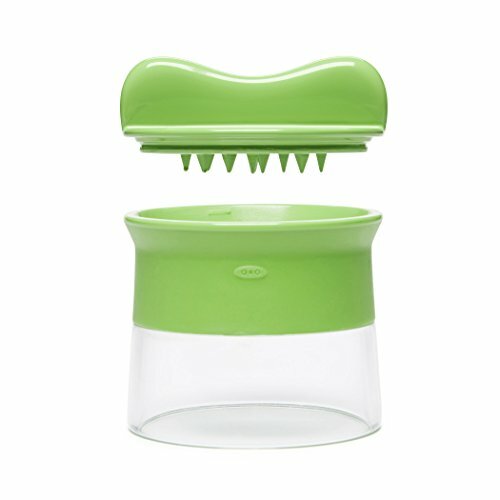 This is great for toppings on soups and salads, and the small size makes it a breeze to store away in a drawer or cupboard. The blades are Japanese steel and are guaranteed not to rust, plus there are internal finger guards to ensure your safety while using the slicer. The whole device is dishwasher safe, making the iPerfect Kitchen spiralizer extremely convenient. 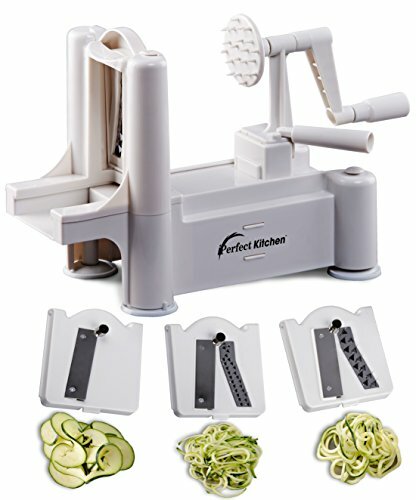 Very similar to iPerfect’s version, this particular spiralizer is also handheld, and allows the user to do the slicing with very little effort. 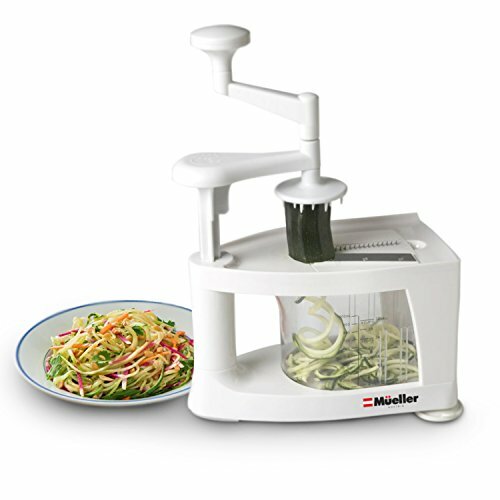 Taking only seconds to spiralize a whole cucumber, you will get linguine style noodles in no time flat using this handy slicer. Great when traveling or camping for some quick and easy hashbrowns, this compact device can fit almost anywhere and is completely dishwasher safe. Kitchen-nv also includes a thin bush in the box if you prefer to hand wash instead. 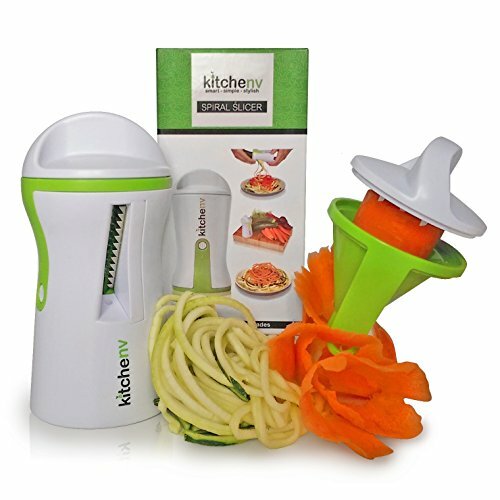 Although it has a small cup-like design, this gizmo packs a punch for those looking to make vegetable noodles on the fly. 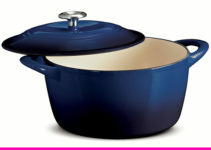 It features a nonslip grip and is dishwasher safe for easy cleanup. It is similar to the above models, but instead of the blade being integrated on the side, it is housed in the top of the slicer. It is utilized similarly to a peppercorn or cheese grater, and is a quick way to top off your favorite meal with some fresh, delicious vegetables or fruits. You can even use it to make curly fries for those rare cheat days with the Good Grips spiralizer. If you are looking for a slicer with more blade variety, than the Brieftons model may be right up your alley. 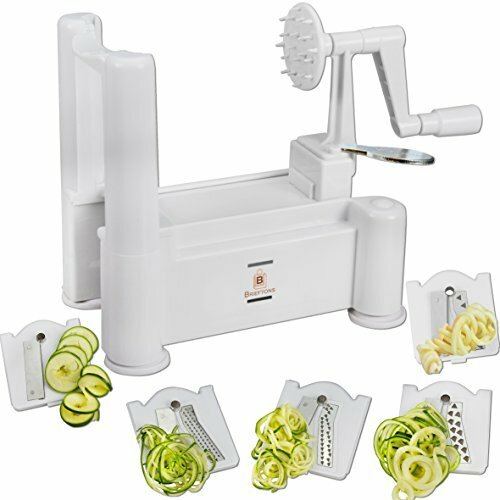 This countertop spiralizer features five interchangeable blades that will create angel hair, curly fry, fine and crude shred, as well as ribbon shaped fruits and vegetables. Simply place your desired food between the spiked holder and the blade, then churn the handle and voila. Perfect slices are achieved every time in only minutes. 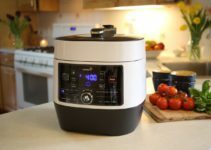 The Brieftons model will take up more room in your kitchen as it is made for the countertop, but is still very easy to travel with as it is not electric. Cleanup is efficient; just snap off the blade to wash in the sink and you are done. 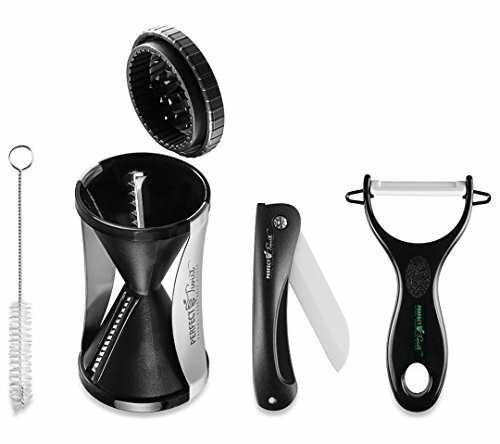 Another win from Brieftons, this model is quite similar to their five blade version but as the name suggests, the handle to spiralize is vertical. So instead of rotating out ribbons horizontally, your are churning them out similar to an ice-cream maker. Included in the package are three pasta blades (spaghetti, fetuccini and papardelle) and one ribbon blade. The bottom compartment beneath the blade houses a drawer to catch your vegetables, which is convenient, if not just another part to clean. The vertical design does make it easy to get the most out of every inch of your food without the waste. The Vertigo spiralizer is another great countertop option for those with a little space in the kitchen. If you already own a KitchenAid hub, this attachment is a great addition to your arsenal of utensils. Not only will this little gizmo spiral your fruit, it will also core and peel it with no effort at all. Simply attach it to your appliance as you normally would, switch it on and let the machine do the work. Place a bowl underneath the spiralizer to catch your fruits without the fuss. The blades of the attachment are dishwasher safe, and will fit comfortably inside of your drawer. They also come with a case for storage. Don’t just call it a slicer. 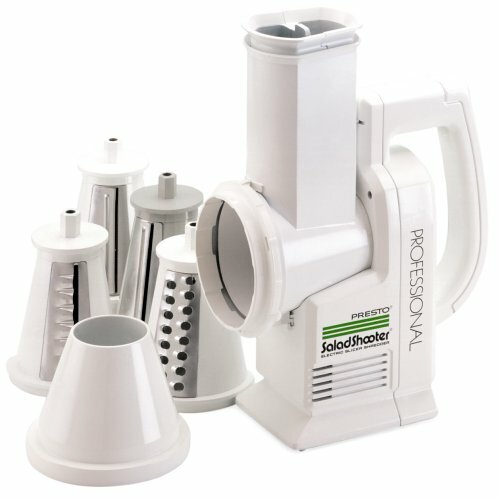 This dream machine will not only spiralize your foods, but acts as a grater, mandolin, and juicer as well. It is considered a countertop model, but for all of the features it boasts, this device is actually quiet compact. The design is vertical like the Brieftons version, and also has a catching compartment underneath the blade. Suction cups at the bottom provide a secure and safe way to slice, and the variety of options available by using the Müeller spiralizer make it a great addition to any kitchen, big or small. The Perfect Twist is a good option for those who are low on space, but still want those funky, curly veggies. With a single gesture, you will certainly have platefuls with this design. 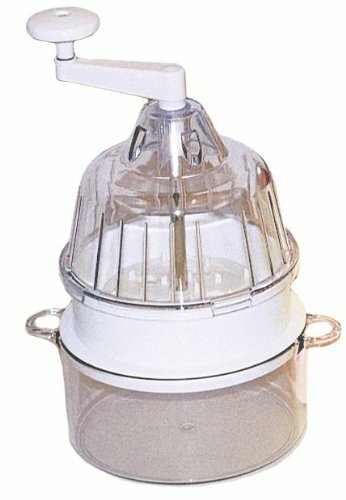 Similar to a parmesan cheese grater, you simply rotate the crank to produce delicious twists of fruit and veggies. This version would be a great starter spiralizer for someone who wants simplicity as well as ease of use. The Perfect Twist is also dishwasher safe, another plus for those who dread any cleanup in the kitchen. Striking a resemblance to the previous model mentioned, the Saladacco is a simple way to dress up that boring dinner salad quickly. Though you may not be a whiz with a blade, you can fool your guests into thinking that you have been practicing with this handy device. You can flawlessly create slices, ribbons or spiral strands in seconds with little to no effort at all, making the Saladacco spiral slicer a welcome extra in your utensil drawer. Simply cap the bottom one you are finished to protect the blades when stored away. If you are looking for an all-in-one machine, the Presto slicer has got you covered. 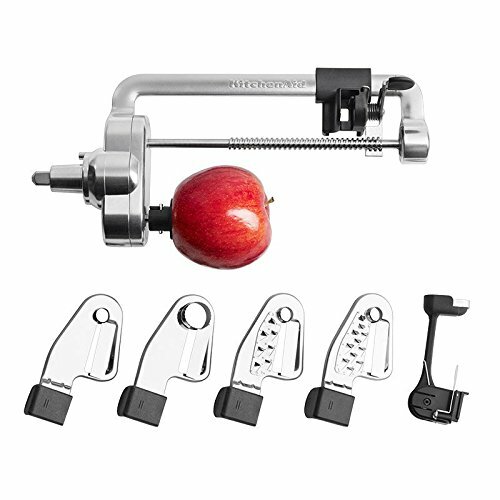 It can chop nuts, slice vegetables and grate chocolate fast; just point and shoot. Four blades are included for regular, thick and thin slices, as well as a grater. Place your food into the funnel and plunge it down, then point the end of the device at your salad bowl. Perfect slices of carrots or cucumbers will shoot out in no time flat, decorating your salad in bright veggies. Although it is a little large for a handheld model, this offers very easy use and is not overly bulky to store in the cabinet. 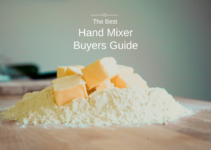 You even have the ability to make bread crumbs for your next Thanksgiving stuffing or grated chocolate for the top of a pie.